The English name, dandelion, is a corruption of the French dent de lion meaning "lion's tooth", referring to the coarsely toothed leaves. 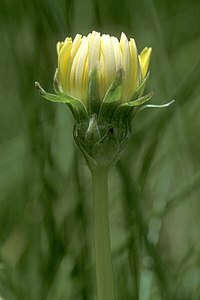 The plant is also known as blowball, cankerwort, doon-head-clock, witch's gowan, milk witch, lion's-tooth, yellow-gowan, Irish daisy, monks-head, priest's-crown, and puff-ball; other common names include faceclock, pee-a-bed, wet-a-bed,swine's snout, white endive, and wild endive. 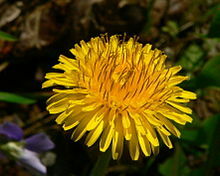 ^ "dandelion clock - Definition from Longman English Dictionary Online". Jonas: Mosby's Dictionary of Complementary and Alternative Medicine. (c) 2005, Elsevier. Ldoceonline.com. Retrieved 2010-07-03. ^ Nowicki, Marcin; Zhao, Yichen; Boggess, Sarah L.; Fluess, Helge; Payá-Milans, Miriam; Staton, Margaret E.; Houston, Logan C.; Hadziabdic, Denita; Trigiano, Robert N. (2019-02-13). "Taraxacum kok-saghyz (rubber dandelion) genomic microsatellite loci reveal modest genetic diversity and cross-amplify broadly to related species". Scientific Reports. 9 (1): 1915. doi:10.1038/s41598-019-38532-8. ISSN 2045-2322. PMC 6374447. PMID 30760810. ^ "Flora of North America". 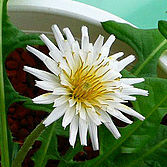 Efloras.org. Retrieved 2012-08-29. ^ "Plants For A Future Search Error". www.ibiblio.org. Retrieved 2017-04-17. ^ Association, Maine Organic Farmers and Gardeners. "Dandelions". www.mofga.org. Retrieved 2017-04-17. 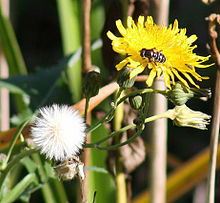 ^ "Den virtuella floran: Taraxacum F. H. Wigg. - Maskrosor" (in Swedish). Linnaeus.nrm.se. Retrieved 2010-07-03. ^ Castronovo Fusco, MA (2008-04-15). "Dandelion as underrated as underfoot". New Jersey On-Line. Retrieved 2011-03-07. 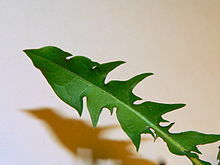 ^ "Dandelion greens, raw". Nutritiondata.com. Retrieved 2011-03-07. ^ Anon. "Companion Planting for Vegetables & Plants". Country living and farm lifestyles. countryfarm-lifestyles.com. Retrieved 2011-03-07. ^ "Welcome to Main Street White Sulphur Springs...Make it home". Wssmainstreet.org. Retrieved 2010-07-03. ^ "Songs of the University of Rochester". Lib.rochester.edu. 2010-01-14. Retrieved 2010-07-03. ^ J., Richardson (1985-01-01). "In praise of the archenemy". Audubon: 37–39. ISSN 0097-7136.